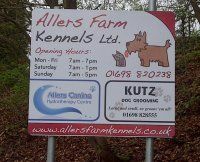 Allers Farm Kennels is based on Stoneymeadow Road, High Blantyre and has been owned and Run by Alan and Morag Reardon since 1991, our well appointed kennels and cattery has a reputation for top quality care for dogs and cats. We are fully licensed, fully insured and have access to a local vet 24 hours a day. The kennels and cattery are open all year and are set in acres of parkland and woods in Stoneymeadow between East Kilbride and High Blantyre. Our quiet location provides a stress-free environment for your pets, ensuring they settle into the kennels and cattery quickly, making our kennels the ideal place to take care of your cats and dogs while you are away from home, whether its a few months, weeks, days or just a couple of hours. We provide everything your cat or dog should need including beds, bedding, bowls, food and toys. However although we are more than happy to give your pets any medication they may be on, we are unable to supply these and you must make sure you provide us with enough to cover your pets stay with us. We can cater for most diets and each dog will be fed the same pet food it is fed at home. This ensures that your pet has no upset to its usual dietary needs. We therefore stock a wide variety of well known pet food brands along with our own platinum range dry food `Allers Farm' this ensuring your pet goes home to you as fit and healthy as it was when it came in. The kennels and surrounding areas are all monitored by CCTV system.We also offer a dog grooming service at KUTZ. By prior arrangement, we can arrange to collect and deliver your dog for its stay with us. This is subject to a small fee to cover our costs.